Amazon continues to crush everyone in retail. That's despite many big names trying to get crafty. This piece first appeared on RealMoney. Please head here to learn more. Don't just stand there, do something, before the Grim Reaper comes to get you. That's how I feel about the Kohl's (KSS - Get Report) -Amazon (AMZN - Get Report) deal that allows you to return merchandise you bought at Amazon to Kohl's, which will box it and send it back to the online behemoth for free. I have been a big fan of the stock of Kohl's for about 10 points because it is a conservative, reliable company that does a lot of things right and is located in strip malls, which make it ideal as a place to return goods. In fact, I think the company's stock, with an almost 5% yield and a fantastic balance sheet, might be a real good idea even now. Sure, the Amazon deal will only be in 85 stores in Chicago and Los Angeles for the nationwide chain. Still, though, I can't wait until it comes east because I can use it aplenty to make my life a heck of a lot easier for us. What happens if you do nothing but take a beating from Amazon? Consider the case of Toys R Us, which filed for bankruptcy today. There are two things you need to know about Toys R Us. First, toys are a category that's easily crushed by Amazon, and second, the balance sheet of Toys R Us has been loaded up with debt as part of a failed leveraged buyout left over from the halcyon days of deals yore. It's been expected and the company doesn't seem to want to go down the liquidation path. This kind of filing might allow the company to get debtor-in-possession financing, which is why the stocks of Hasbro (HAS - Get Report) and Mattel (MAT - Get Report) aren't getting hit. 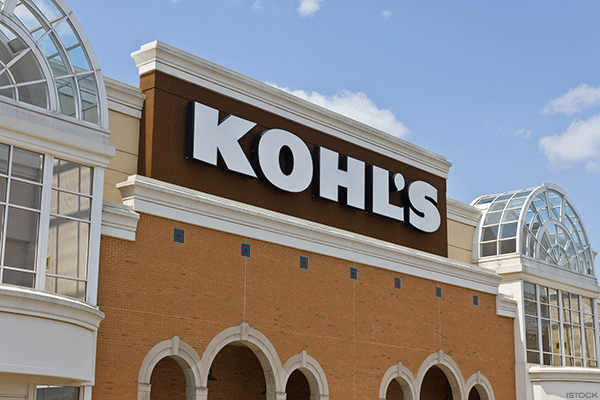 Your local Kohl's is waiting for your Amazon return. Who else is taking action to make sure it's not Amazon roadkill? I think Macy's (M - Get Report) is introducing a lot of fashion and sprucing up its stores to make sure it isn't left behind. But that's a work in progress. Childrens Place (PLCE - Get Report) has done a remarkable job as a category winner. It defeated Gymboree and is now the last man standing in the mall, thanks to the smart work by Jane Elfers, the unsung CEO. Elfers recognizes the more sizes the better, and given how quickly kids grow, unless you want to run to Kohl's all the time to return goods to Amazon, it really is easier to try them on. We got a second upgrade for Gap (GPS - Get Report) this week, and that's related to the chopping of bad stores and the reasonable price for all its divisions, not just Old Navy. Of course, when you build up a full head of steam, as Best Buy (BBY - Get Report) did before its analyst meeting on Tuesday, you run the risk of having the rug pulled out from under you if you go conservative, and that's exactly what they did. And it's hard to be able to tell a good story if you sell food or drugs, which is why I gave up on Walgreens (WBA - Get Report) for my charitable trust and am not tempted to buy the stock of CVS (CVS - Get Report) . Amazon's going to crush it in food and can go prescription, which is the bread and butter of the front and back of these stores. Athletic apparel remains tough and I am not going to disagree with the now-frequent downgrades of Nike (NKE - Get Report) and Under Armour (UAA - Get Report) or the pancaking of the stock of Finish Line (FINL . But do not rule out the newfound alliances with Amazon or the more aggressive style of those we think are being left behind, including, by the way, Walmart (WMT - Get Report) with its Jet.com. It's not over until the fat lady sings, and I am not hearing anything from her yet, that is if there's ever going to be a song at all. Watch PayPal (PYPL - Get Report) CEO's share his outlook on retail with TheStreet.